By far the most popular national park in the United States, Great Smoky Mountains National Park’s 10.5 million annual visitors double what runner-up Grand Canyon sees. 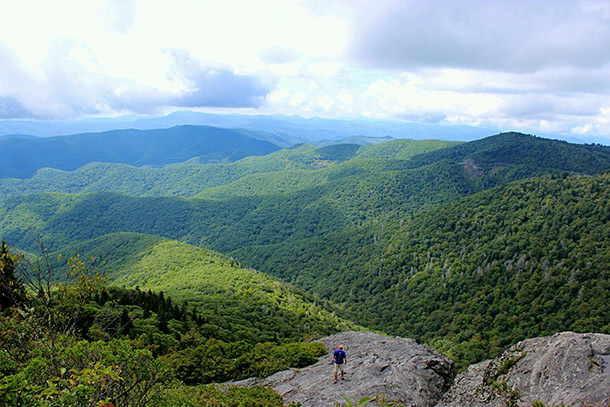 Yet despite the millions of visitors who drive through it each year, usually on the scenic Blue Ridge Parkway, the park manages to preserve a piece of Southern Appalachia that hardly exists anymore. Its dense, old-growth deciduous forests are home to 130 native tree species, as many as on the entire European continent. This rich woodland is considered so important that UNESCO has named the park both a World Heritage Site and an International Biosphere Reserve. The trees are also responsible for the phenomenon that gives these mountains their name—their leaves exhale volatile hydrocarbons that form a smoke-like haze that hovers over the range. The 800-square-mile park, which straddles the border between North Carolina and Tennessee, also preserves more than 90 log buildings, including churches, barns, schools, and grist mills, offering a glimpse into Appalachian life more than 100 years ago when small communities called these valleys home. Cades Cove is the most popular destination in Great Smoky Mountains National Park, a broad pastoral valley encircled by an 11-mile driving loop where sightings of white-tail deer are common, and, occasionally, coyote, turkey, and even black bear. Great Smoky Mountains National Park isn’t just famous for its trees. “Wildflower National Park,” as it’s sometimes called, is prized for the breadth of its wildflower diversity: More than 1,500 species of flowering plants are found in the park, the most of any national park in North America. Lady slipper orchids, jack-in-the-pulpit, columbine, crested dwarf iris, 10 species of trillium, bleeding heart, and violets—just to name a few—are celebrated every April at the park’s five-day “Spring Wildflower Pilgrimage.” This year’s event (April 19-23) will feature guided programs, walks, photographic tours, art classes, and more. April is prime time for Pinnacles, on the eastern edge California’s Salinas Valley. The wildflowers are typically at their peak and the temperatures have not yet started their climb into the occasional triple digits of summer. Our newest national park (inducted in January 2013) is popular with rock climbers and hikers, but probably most famous for its population of California condors, which were nearly extinct 25 years ago. Thanks to a captive breeding program, the magnificent condor—whose wingspan reaches nearly 10 feet—now number more than 400 in the entire world, 32 of which are free-flying at Pinnacles.